How to maintain your Robin engine from Aztex Equipment. you find that emissions also are typically higher, and you may also experience trouble with spark plugs. Modifying the carburettor will improve both performance and emission levels. 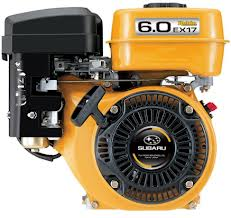 Moving to a job site below 1,500 m requires converting the engine back to levels recommended by the manufacturer. Failure to do so will cause the engine to overheat and can result in damage. As well, on hot summer days, operating an engine after the mercury has moved past 37 ˚C can be problematic. Ensuring dirt does not obstruct an engine’s cooling mechanisms will help prevent problems with overheating. However, note that you should not attempt to cool a hot engine with water. The temperature difference between the water and the engine will most likely damage the engine. You also should check and change the oil and oil filter more frequently than normal when using an engine in hot weather. Take the heat into account when choosing the oil’s viscosity, as well. On the other end of the thermometer, monitoring the oil’s viscosity remains important. If a cold front should move in before the oil has been changed to a more appropriate viscosity, move the machine to a warm, well-ventilated space before attempting to start the engine or change the oil. Keeping the fuel tank full will prevent moisture from condensing inside the tank when it’s cold, which can cause problems with engine operation. Ensuring the battery remains well-charged also will combat problems an operator may face in a cold environment. One trick to ease frustration if the machine needs to remain outside during winter and a big drop in temperature is anticipated you can push the throttle to the middle of its speed range. Should ice form on the linkage, it will be easier to start the engine with the throttle in this position.Whether it’s the off-season or other circumstances that prevent operating your engine-powered equipment for more than 30 days, several steps need to be taken to protect the engine. The first step in preparing an engine for storage is performing all of the suggested daily maintenance items, such as cleaning the engine and checking the air filter. Next, drain the fuel from the fuel tank and carburettor float chamber. This is one of the most important steps in preparing an engine for storage. Over time, the volatile components of fuel evaporate and the fuel becomes stale. Stale fuel makes starting the engine difficult, if not impossible, when the machine is taken out of storage. Although it is usually suggested to drain the fuel, filling the tank with new fuel and adding a fuel stabiliser is another option for preventing a stale fuel situation.To prevent corrosion in the cylinder bore during storage, remove the spark plug and inject a few drops of oil through the spark plug hole. Gently pull the recoil starter knob two or three times before the spark plug is placed back in the spark plug hole. As well, pull the recoil starter knob until the resistance is felt, and leave it in that position. End the process with a final engine cleaning before placing a protective cover over the unit. Then you can store this and in a dry place. When returning the engine to service, ensure the oil viscosity is adequate for the temperatures expected. Check the fuel lines and filter, making sure they are still secure and have not cracked. Be sure that the throttle, choke and governor linkages move freely before starting the engine. The initial start for an engine coming out of storage may be slow and there could be smoke for a few minutes until any oil in the cylinder burns off. If the engine fails to start, check the spark plug since it may have been fouled by the oil added to the cylinder before the machine was stored. Clean or replace the spark plug before attempting to start the engine again.Whether you’re preparing an engine for storage, adapting it to the weather or just keeping an eye out for warning signs, giving an engine the attention it deserves will go a long way toward keeping it out of trouble.